It took us 20 years to get here, but finally it's happening. We are proud to present our debut 12"! The 19th of August 2013 the first songs from the world of Father Robin will truly come to life. The Twilight Fields 12" will be released as a limited edition in 300 hand numbered copies on the small underground label Fresh Tea. The 12" will also include the song The Ritual of the Beneficial Ancestor. The illustrations are done by the excellent english artist Oliver Barret. 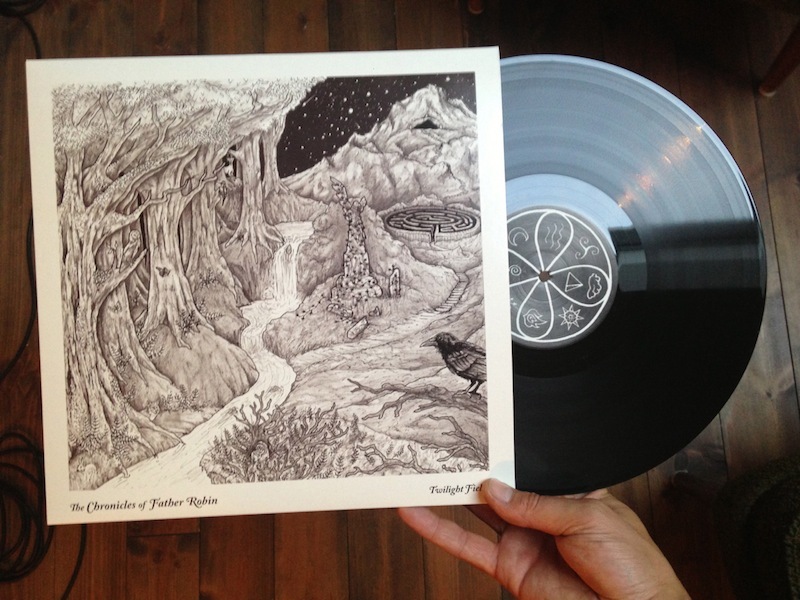 Twilight Fields is a dark and beautiful prog epic filled with haunting passages, eerie vocals, complex rythmic structures and hard guitar riffing moulded from the majestic norwegian nature. The song is inspired by bands like King Crimson, Black Sabbath, Led Zeppelin, Yes, Änglagård, Anekdoten etc. Twilight Fields is recorded at Bekk Studios on the southwest coast of Norway by Eirik Bekkeheien. Lars Fredrik Frøislie (Wobbler, In Lingua Mortua, White Willow) contributes with a large selection of analog keyboards (Mellotron, Chamberlin, Clavinet, Mini Moog, Hammond C-3, Cembalo etc.). The song is taken from the limited triple vinyl boxed set The Songs & Tales of Airoea which will be released in 2014. Twilight Fields 12" will be available through FreshTea.no. Oslo & Akershus: Stein & Jord, Big Dipper, Tiger, The Garden, Neseblod, Oslo Rock Antikvariat, Vinyl Å Sånn, Platekompaniet (Sandvika), Ali Bla Bla (Bekkestua).